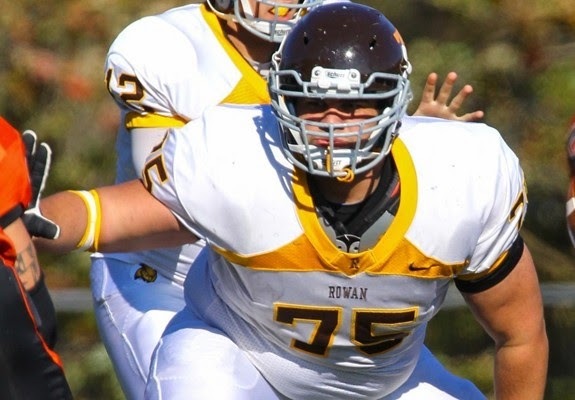 Headed into its 2014 season opener against Widener University on Sept. 5, Rowan football has prepared for the many different situations that the opposition might present. With Widener beginning its third straight season under a new head coach, there is not much that the Profs and head coach Jay Accorsi can specifically plan for. “[Davis] is very dynamic, probably one of the better receivers we’ll see all year long,” Accorsi said. For Widener, star wide receiver Anthony Davis continues to climb the university record books and enters his final season with the team as a top threat on both offense and special teams. Meanwhile, quarterback Seth Klein comes off a season in which he passed for 2,809 yards — fifth most in Widener history — 17 touchdowns and finished second in the nation with a 74.4 completion percentage. Widener’s offense poses a formidable test for the Profs’ defense. Defensively, Widener totes a strong front seven, which means Rowan’s passing attack must be able to take advantage of its opportunities. Leading up to the team’s matchup, Accorsi recognized offensive and defensive players who have looked impressive in practice. “I’d have to say that, defensively, [safety] Kurt Kingett has looked really good,” Accorsi said. “I think Kurt is really starting to come on in the secondary, and I think [linebacker] Tyler Jenkins has flashes and can be a dynamic player for us. Switching tones, Accorsi encouraged everyone attending Friday’s home matchup versus Widener to learn the Rowan fight song, “Let’s Hear it for the Profs!” For every touchdown or score in the game, he wants everyone to sing the fight song. He has also planned for his players to run over to the stands, face the crowd and sing it together at the end of the game.